Qualified hardware posted a great article that lists all the different types of locks. This is a good guideline for those purchasing a lock or interested in lock picking. The original post can be found HERE. 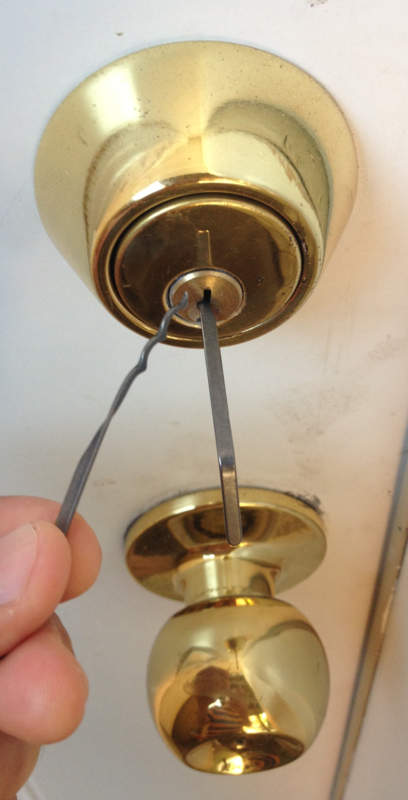 Also check out my other lock picking posts by searching on this blog for lock picking. Selecting new locks, whether for your home or business, can easily be overwhelming. While the vast variety of options to choose from is certainly nice, it also makes narrowing down your selection to the best lock extremely difficult. Simply put, there are dozens of different types of locks, each with their own specific set of pros and cons. In addition, each lock has its own best application. Below we break down the ins and outs of a number of the most popular locks. We detail what each lock type is, how it works, and the security factors you should consider about each. The goal of our breakdown is to help you select the absolute best lock depending on your individual needs and preferences. One of the most common lock types around, padlocks are also among the most recognizable locks on the planet. Though they come in a number of different sizes, it’s their distinctive freestanding design that sets them apart. They are the only type of lock that doesn’t need to be permanently attached to anything else to properly function. When it comes to padlocks, there are two main subtypes. These are combination padlocks and keyed padlocks. The names say it all: combination padlocks require a numerical combination (entered on a row of numerical dials) to open while keyed padlocks require a key to open. Among combination and keyed padlocks, there are a number of other subtypes. This is especially true of keyed padlocks. For starters, there are rekeyable and non-rekeyable options available. As their names imply, a non-rekeyable doesn’t allow you to rekey the lock (make a new key) while a rekeyable does allow you to do so. Another big subtype of keyed padlocks is key-retaining and non-key-retaining. Once again, the names are straightforward. A key-retaining lock doesn’t allow you to remove the key while the padlock is open. On the other hand, a non-key-retaining lock allows you to remove the key while the padlock is open. It’s important to note that padlocks, both combination and keyed, are often easy to break or shimmy open. They aren’t high among the most secure lock types though they are cheap. This makes them popular for low-security applications such as keeping a tool shed locked. Another very popular type of lock, the deadbolt is most often used on external doors. Chances are your home, especially if it’s a house, uses a deadbolt on the front door. Like padlocks, deadbolts come in a variety of different subtypes. Their primary varieties include single, double, and lockable thumb turn. Single cylinder deadbolts are most popular, especially in North American homes. A key cylinder makes up the outside of the lock with a thumb turn (also known as a rosary) on the inside. The only real disadvantage to this type of lock is the thumb turn. If, for instance, even a small a window is located nearby, tools can be used to easily open the thumb turn and unlock the door. Double cylinder deadbolts are less popular but more secure. The reason they aren’t used more commonly is because they require a key to open the door from both the inside and the outside when it’s locked. Their simple design eliminates the thumb turn, replacing it with a second key cylinder. While a lack of convenience is a valid concern, this type of lock can also be dangerous in emergency situations such as fire. The lockable thumb turn is a sort of hybrid between single cylinder and double cylinder deadbolts. The basic design is much like a single cylinder with a key cylinder on the outside and a thumb turn on the inside. The difference is that the thumb turn itself can actually be locked or unlock. This means you can leave it in the unlocked position when the area in question is in use and then lock it after everyone has left. Though expensive, this is by far the most versatile and secure deadbolt lock on the market. Commonly used in residential settings, you’ll often see knob locks installed in addition to deadbolts on exterior doors. It’s very important to note that they should never be used as a standalone lock on exterior doors. The reason for this is that the lock cylinder itself is located on the knob and not the door. This makes it very easy to knock off the knob with a hammer. Alternatively, pliers, a wrench, and a screwdriver can be used to get behind the knob. Both of these methods allow you to bypass the locking mechanism altogether. While knob locks were once a popular option, they are no longer recommended for most functions. The only place you’ll really see them being used correctly is in residential settings on interior doors between rooms. Lever handle locks are most commonly used for commercial applications, specifically on interior doors. It’s extremely rare to see them used in residential settings. They are also frequently used where handicap accessibility is a must. The big benefit of lever handle locks is their ease of use. They are much easier to open than knob locks because of their push style handle. You aren’t required to grasp and turn them. If security is a top priority, you might consider investing in a “clutch” lever handle lock. This type of lock is resistant to torque attacks. In other words, when pressure is applied to the handle to force the lock, the handle simply turns instead of applying pressure to the lock. Cam locks are a very versatile type of lock most often used for low-security applications. You’ll commonly see them on filing cabinets and mailboxes. Cam locks are available in a wide variety of different lengths and a handful of different subtypes. Indeed, they’re one of the most customizable types of locks around. Commercial doors and glass entry doors are often equipped with rim cylinder or Mortise cylinder locks. Some apartment doors also utilize this type of lock. Though the two types of locks are often lumped together, they are actually slightly different in design. The big difference between rim and mortise locks is the type of hardware they are used on. For instance, rim locks are most often mounted on the inside of a door. A long piece of metal extends out the rear of the lock, runs through the door, and ends in a locking mechanism on the other side. Two screws hold the lock in place from the inside of the door. Mortise locks, on the other hand, actually screw into specially made mortise hardware and are mounted inside of the door. A set screw holds the lock in place while a cam helps the lock work properly. There is amazing variety in the lengths of the cylinders as well as the type of mortise hardware. Also known as DIN cylinders, Euro profile cylinders are a type of lock that, as their name implies, is commonly used in Europe. Much more rarely, they are used in certain applications in North America, including sliding glass door locks. A variety of Euro profile cylinders are available. These include single cylinder, double cylinder, and single cylinder with a thumb turn. However, the standard design is pretty much the same throughout. A single screw runs through the cylinder to hold the lock in place. Unfortunately, this single attach point allows the lock to be easily snapped or otherwise removed from the door if not properly installed. Wall mounted locks often come in the form of a firefighter’s style box lock. These are often used to house emergency access keys at larger businesses. As their name implies, wall-mounted locks are actually attached to the wall. In addition to key storage, larger style wall mounted locks can even be used as small safes for valuable items. The majority of wall-mounted locks are more easily installed at the time of the building’s construction. However, there are certain varieties that can be installed on existing buildings. Interchangeable core cylinders are a type of lock that has a core that can be swapped out without taking the core apart. This gives those that use them the ability to easily re-key the lock without much hassle or expense. For this reason, they are commonly used in large institutions and businesses. Two different types of keys are used for interchangeable core cylinders. The locks use both a normal key and a control key. While the normal key functions like any other type of key, the control key is the one that pulls the entire core from the lock. There is no need to remove any screws. The quick functioning of this process allows the locks to be upgraded or rekeyed in a matter of seconds. A broad category of locks, furniture locks make up those locks used for items such as cabinets, desks, and sliding doors. Though there are numerous variations, they come in two primary styles. These are bolt style and push button style. The bolt style furniture lock consists of a piece of flat metal inserted sideways into the lock. This is used to secure the device. Desks, cabinets, and drawers are the most common places to find bolt style locks. Push button style furniture locks, on the other hand, consist of a rod that comes through the back of the lock. This is used to secure the device. Unlocking the lock simply pops the retracting rod back into the main body of the lock. You’ll commonly see furniture locks on cabinets and sliding doors. Also known as T-handle locks, vending locks are commonly found in vending machines. Opening the device actually consists of pulling the entire T-handle lockout. You can either reinsert the old T-handle or insert a new one to upgrade/rekey. You’ll often see jimmy proof deadbolts, a simple modification on the normal deadbolt, on apartments and double doors. The reason for this is their overall effectiveness and the minimal work needed to install them. They simply use a deadbolt that overlaps with the jamb bracket, creating an interlocking surface. Popular in some new apartment complexes, rim latch locks actually auto lock the door being used after you leave. Unfortunately, they are easy to break through with a minimal amount of force. The key in knob cylinder isn’t a specific type of lock like most on our list. Instead, they are the cylinder mechanism found at the heart of the majority of different lock types, particularly knobs, levers, and deadbolts. Many OEM applications, such as sliding glass doors, also make use of key in knob cylinders. In most cases, the actual cylinder is hidden inside the knob. Only the surface (where you enter the key) is shown. Though most key in knob cylinders look the same, there are no specifications for their design. You can find literally dozens of different variations. The Berlin key lock is an interesting style of lock that you don’t see much these days. It was originally designed to force people to both close and lock doors every time they were used. The key for the Berlin lock comes with two key blades. It must be slid from one end of the lock and retrieved from the other side of the door. Often used on garages and apartment buildings, a disc tumbler lock is made up of a number of slotted rotating detainer discs. A special key is used to rotate these discs like tumblers. When the discs are aligned, a sidebar is allowed to drop, opening the lock in the process. 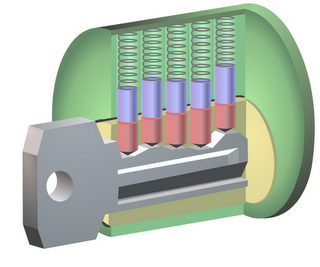 One of the biggest benefits of disc tumbler locks is that they don’t contain springs. This means they are great for outdoor applications where harsh conditions are the norm. The locks discussed above are only the tip of the iceberg as far as lock types go. There are a number of other lock types, most of which are far less commonly used. The chances are that one of the locks above is perfectly suited to the application you have in mind. I didn’t know that there are so many different types of locks that could be used. I think it is interesting that knob lock is great because how easy they can lock, but could be teamed up with a dead bolt. I think I need to put dead bolts on my outdoors so I can be more secure.